The quest to find a long lasting garage floor paint that will stand up to use and abuse may finally be over. That’s right, we said it. 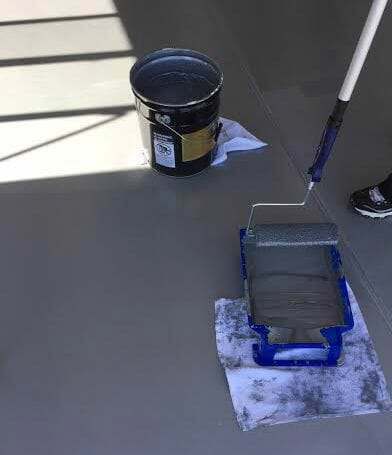 There really is a durable concrete floor paint available that will last for years, not peel, and not develop the dreaded hot tire lift problems associated with paint. 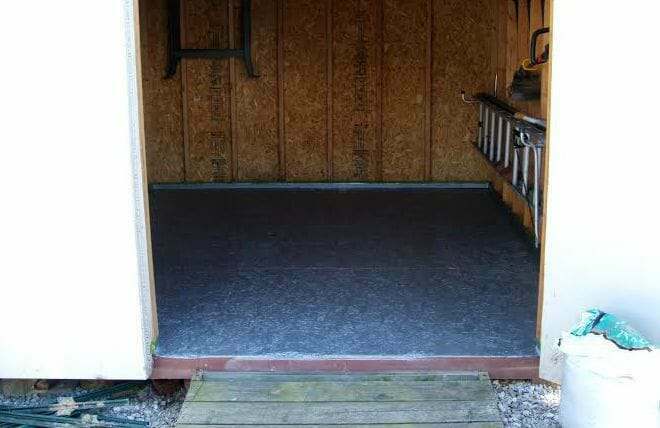 One of the reasons painting a garage floor is still popular is due to the fact that it’s much easier to apply to concrete than an epoxy coating. It goes down easier, it doesn’t require all the surface preparation that epoxy does, and it appeals to the DIY crowd. The problem, however, is that paint is not very durable and will only last a year or two at most before it needs to be touched up or repainted all together. 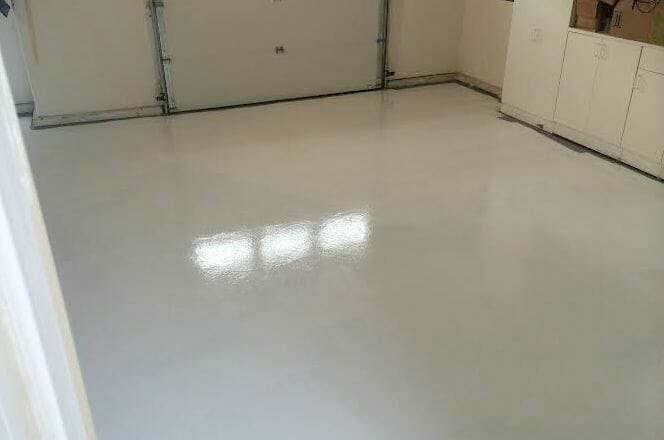 An epoxy coating is far superior to paint and can last for years, but it requires that that you acid etch or grind the garage floor first before application. This process causes many of the DIY crowd to shy away from the benefits of epoxy. 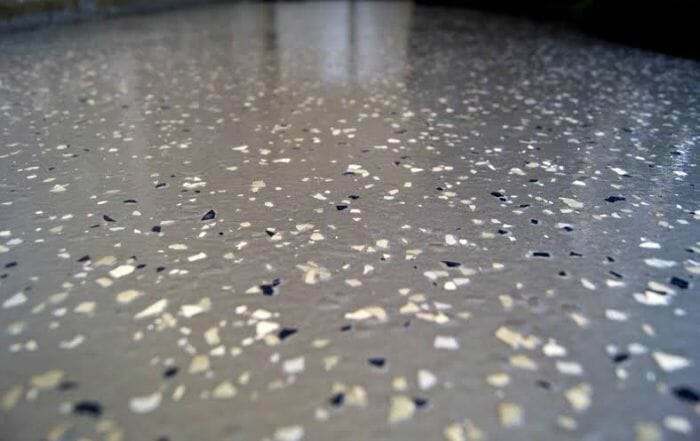 There just hasn’t been a manufacturer that makes a concrete paint/coating with similar benefits to epoxy that doesn’t require acid etching or grinding of the garage floor first. Known to some automotive restoration enthusiasts, a fairly new company called Rust Bullet developed and then introduced in 2003 a 1-Part moisture cure polyurethane paint coating to stop rust and corrosion in metal. It soon became apparent, however, that this paint had many other capabilities as well, one of which is protecting concrete under extreme conditions. It wasn’t until recently though that Rust Bullet eventually found its way onto the garage floor as a long lasting, tough, and durable garage floor paint. Here is a quote from them. 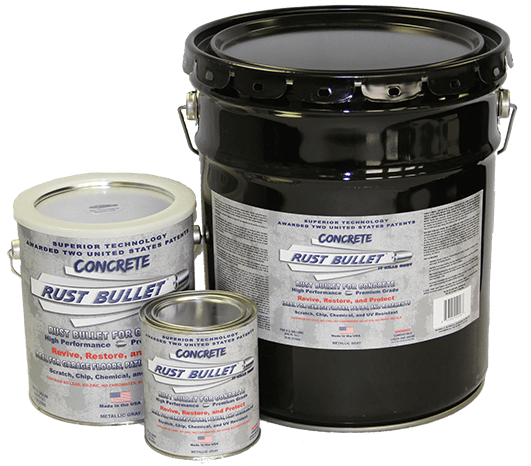 Rust Bullet, with its Superior Patented Technology for rust and corrosion control provides outstanding protection to many surfaces, including concrete. Rust Bullet not only improves the appearance of concrete, it provides an impervious shield allowing easy cleanup of oil, grease and chemical spills along with strong protection against impact and abrasives. You will be hard pressed to find a statement like that from any other manufacturer of a single-part concrete paint for a garage floor. A Rust Bullet garage floor by a gentleman in Georgia. So what makes this paint better? Well to start with, Rust Bullet technically is not traditional paint as we know it. It’s marketed that way because like paint, it’s a single-part coating that doesn’t require a second component to mix in. It is easy to apply like paint and because it is thinner than most coatings, it can also be applied to other surfaces with the use of a spray gun. Most concrete garage floor paints are either latex acrylic or a blend of latex acrylic with small amounts of epoxy resin added to increase durability – also known as 1-Part epoxy paint. Rust Bullet ,however, is a moisture cured urethane (polyurethane) coating that is applied like paint. This curing process allows the coating to crosslink – similar to epoxy, which develops a much denser and tougher coating than regular paint. This makes the properties and benefits of Rust Bullet to a lesser degree, similar to a high performance polyurethane coating. Unlike epoxy and polyurethane, however, Rust Bullet can be applied in temperatures as low as 35°f. Rust Bullet also has a solids content of over 62% compared to the 36% solids of the leading 1-Part epoxy garage floor paint. This means that less than 38% of the product evaporates into the air during the curing process, compared to 64% with the leading floor paint. What this translates to is a coating whose dry film thickness (DFT) is almost twice as thick as 1-Part epoxy paint – 2.5 mils vs. 1.4 mils. This additional thickness contributes to its long lasting durability as a garage floor paint. Paint does not respond well to heat (neither do cheap epoxy coatings for that matter) and is the number one enemy that contributes to hot tire lift. As hot car tires sit on the painted surface over time, the heat from the tires causes paint and low quality coatings to soften under the tire. This relaxing of paint and coatings, combined with the contraction and grip of the tire footprint as it cools, causes the paint to delaminate and pull up with the tire when it is moved. Rust Bullet combats this with a sustained thermal ability of 314°F and will withstand heat upwards of 625°F for up to 72 hours. Your tires would melt before they ever got that hot. This feature was one of the primary reasons that Rust Bullet was first used as a garage floor paint. As a result, hot tires will not affect the coating which means that there is no hot tire lift – period. 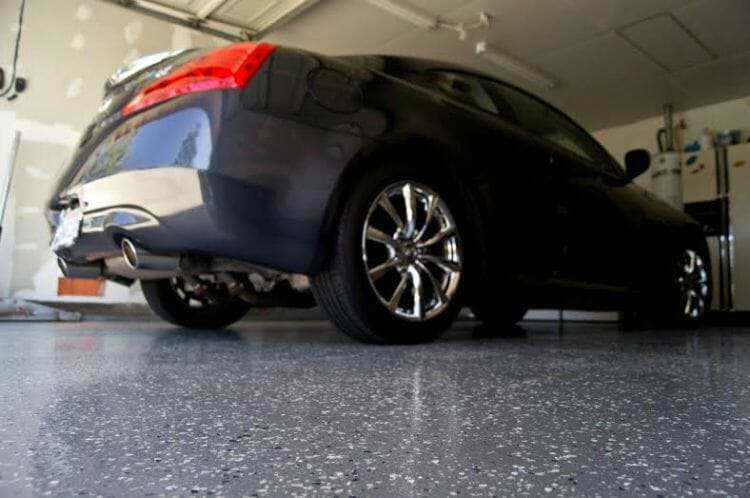 One of the greatest benefits of Rust Bullet as a garage floor coating is that it does not require acid etching or grinding of your garage floor before application. 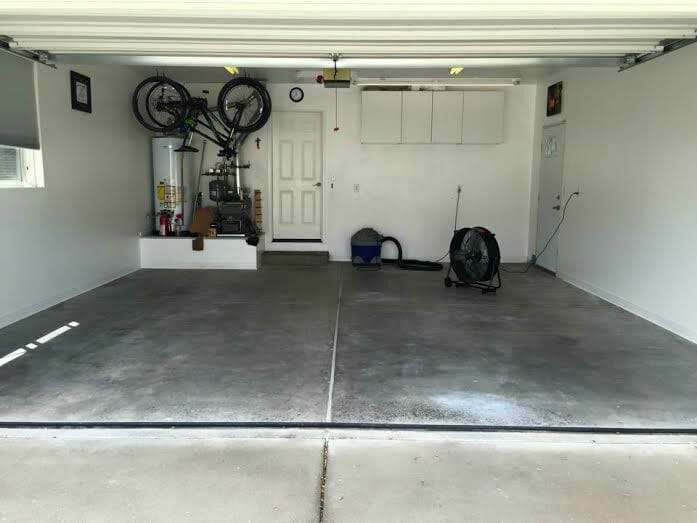 That’s right… As long as the concrete of your garage floor has not been previously sealed, the only required floor prep is to clean the concrete prior to application and Rust Bullet will provide a tenacious bond. This is a huge benefit to the average DIY installer. 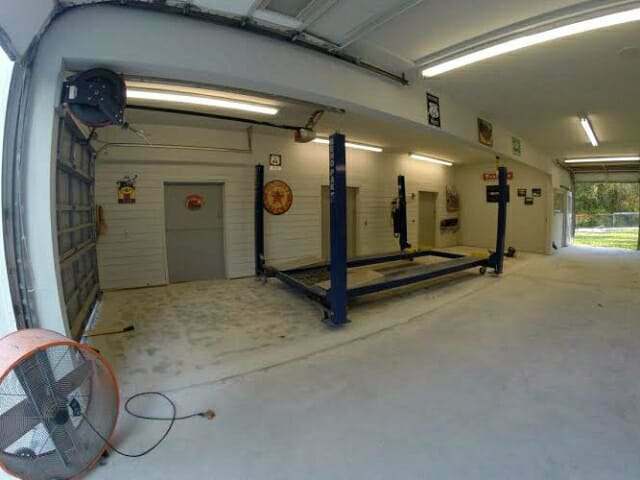 Many times people shy away when they discover the amount of preparation that is required for a premium garage floor coating. Rust Bullet literally removes the fears of having to acid etch or grind the concrete before installation. As long as your garage floor has not been previously sealed or is not extremely smooth, all that is required is a good cleaning of the concrete beforehand. To verify that your garage floor will accept Rust Bullet for Concrete without further prep, you need to do a water drop test in various areas of the concrete. Drip small amounts of water onto the surface. If it does not bead up and is absorbed within a minute then your concrete will accept the coating. If the water does bead or it takes much longer to be absorbed, then Rust Bullet states you will need to etch the concrete or sand the surface with 120 grit sandpaper first. Now that we know the differences between Rust Bullet and typical garage floor paint, let’s examine the actual benefits of Rust Bullet as a concrete garage floor coating. 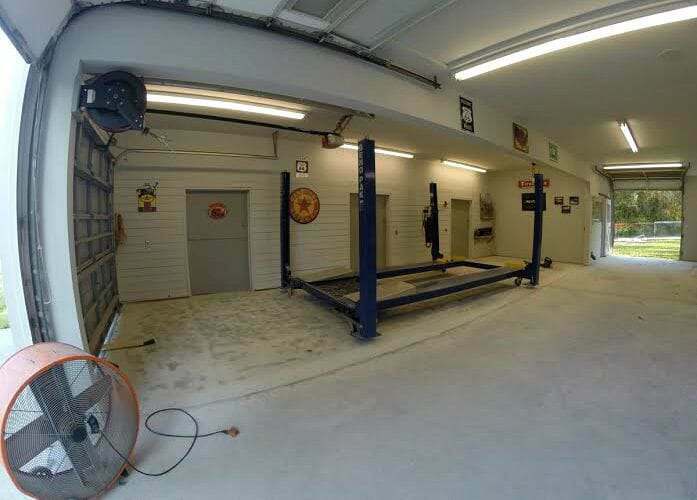 Many of these benefits are similar to some quality epoxy and polyurethane coatings and far superior to the top garage floor paints and inexpensive garage floor epoxy kits. As you can see, Rust Bullet has similar benefits as some premium garage floor epoxy coatings. And unlike concrete paint and low cost epoxy flooring products, Rust Bullet also has a very high tolerance to chemicals. It is highly resistant to oil stains and automotive chemicals such as anti-freeze, brake fluid, and battery acids. It has also been subjected to numerous tests of magnesium chloride which is a prime ingredient in deicing fluids – the same stuff that does extensive damage to concrete garage floors during the winter. There is not one manufacturer of DIY concrete floor paint that can stand up to all of that. In fact, low cost epoxy garage floor kits do not rate nearly as well either. For more information, you can review their data sheet here. When it comes to color selection, not everything comes up roses for Rust Bullet. 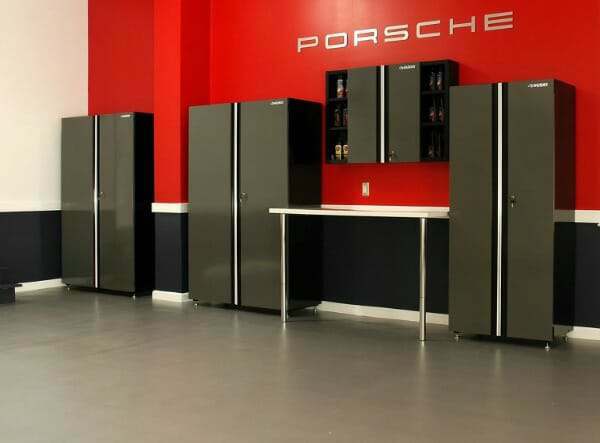 Unfortunately you are somewhat limited to color selection in terms of the traditional choices for garage floor coatings. Metallic Gray in a semi-gloss finish is the only color available as a base coat. If you want beige,tan, or a darker gray then you are out of luck. However, as another option you can apply a top coat of their very vibrant ColorShell selection to add a high gloss and colorful top coat. As you can see, these are very bright colors. 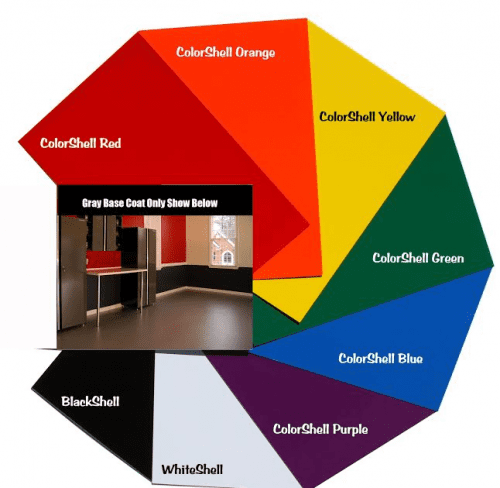 They just might work for some people, however, for most garage floors these colors are not the best for blending with most decor. Our favorite is the white. White can be a very hard color to apply for a garage floor coating and Rust Bullet pulls this color off wonderfully. There is a solution to limited color choices though. 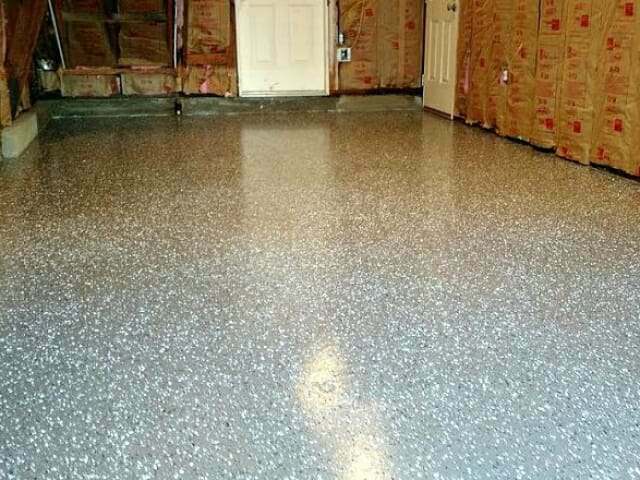 Rust Bullet can be installed as a typical multi-coat garage floor epoxy system with the use of color flakes. Just broadcast the color flake of choice into the metallic grey base coat to produce the look you want and then seal it in with a top coat of their Clear Coat for Concrete coating. Another option would be to create any color combination of flakes to completely cover the metallic gray base coat when they are broadcast over the coating to full refusal. 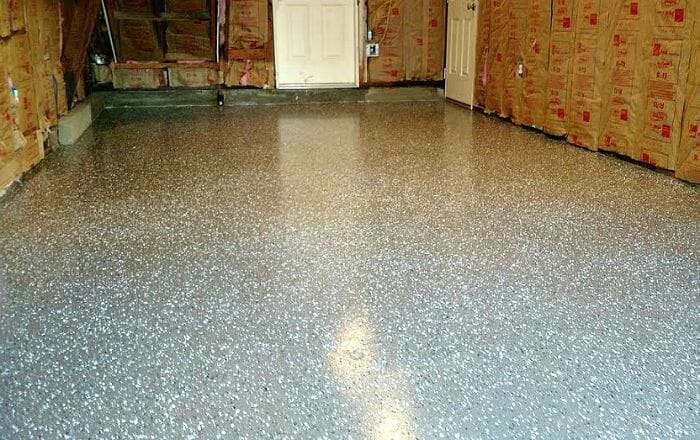 Once the coating has cured for a few hours you can scrape up the loose flakes and lock them in with a couple coats of the Rust Bullet Clear Shot, You will then have an extremely durable, multi-coat garage flooring system that will last for years. 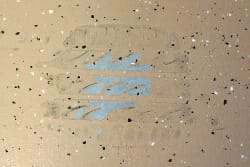 How Slippery is Rust Bullet? According to Rust Bullet, the metallic gray provides almost the same non-slip protection as bare concrete. However, the Clear Coat and ColorShell top coats can be very slippery when wet. You will want to add an anti-slip additive to it to provide for good non-slip protection when using a top coat. One gallon will cover 300 – 400ft², which is enough for most standard 2-car garages. 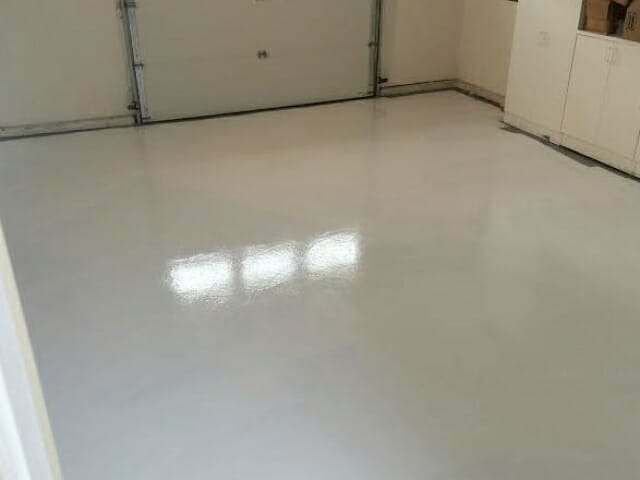 Rust Bullet recommends a minimum of two to four coats on a garage floor, depending on porosity, in order to achieve the recommended dry film thickness for the best performance. One nice option is that Rust Bullet is also available in smaller 1 quart and 1 pint sizes as well. This comes in handy and can actually save you a lot of money if you have a slightly larger garage floor that may require a little more than one gallon. 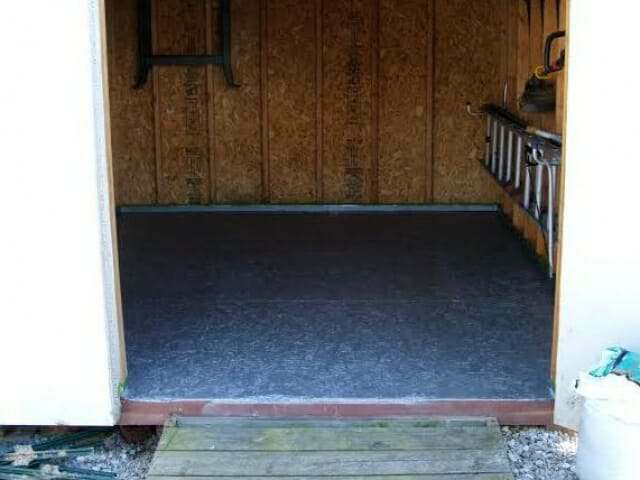 Many of your typical garage floor coating kits do not offer amounts less than a gallon. This can require you to purchase an additional gallon to meet your square footage requirements which creates a much greater expense. As good as Rust Bullet is as a long lasting and very tough garage floor paint, there are some factors to consider. The first is that it lacks in the more traditional garage floor coating colors. Are you listening Rust Bullet? The standard semi-metallic gray is the only base coat color available. Rust Bullet did listen and has now released a new concrete coating called DuraGrade that is available in multiple colors. 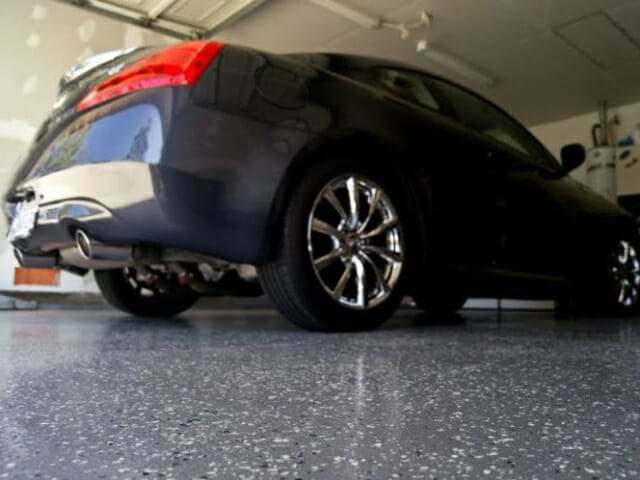 While not quite as durable and chemical resistant as Rust Bullet Concrete, it performs well as a garage floor coating. You can read about it here. 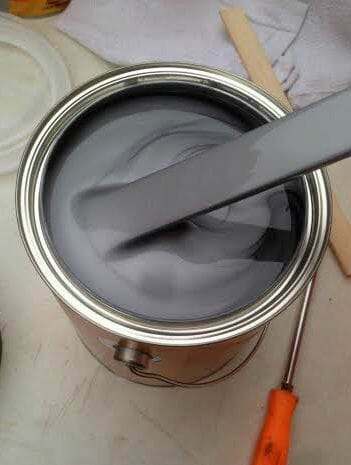 The gray color is also a monochromatic paint. It doesn’t create a nice glossy and colorful finish like epoxy can unless you utilize the Clear Shot or Color Shot top coats. It will, however, produce a nice semi-gloss metallic gray finish that is easy to maintain and provides for a very clean look. 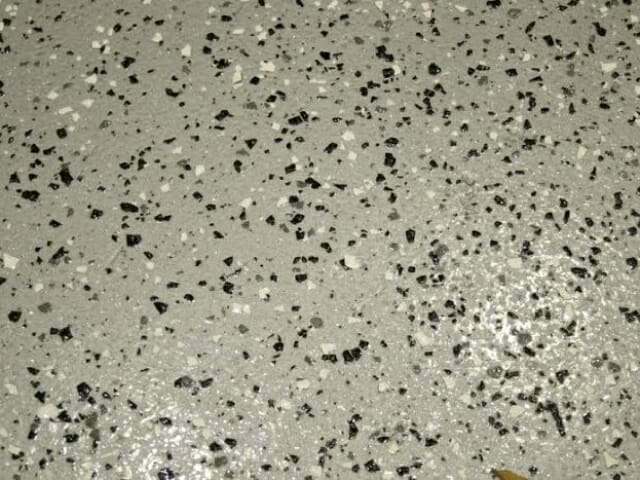 Another issue is that the mono chromatic color of the metallic gray tends to show the defects and poor patch repairs in the concrete more than a thicker epoxy coating would. Additional coats or the application of color flakes can help to alleviate this. Additionally, Rust Bullet is a solvent based coating and produces strong fumes. You will need to wear a respirator or have good ventilation during application and turn off all flame and ignition sources in the garage before you start. Price is something to consider as well. Rust Bullet is more expensive than the leading 1-Part epoxy garage floor paint and almost 2 times more expensive than the traditional garage floor epoxy kits by manufacturers such as EpoxyShield or Quikrete, as an example. Though more expensive, the initial cost will actually save you time and money in the long run due to the fact that it’s such a long lasting floor paint. In all fairness, it really should not be compared to these lesser quality products because in essence, Rust Bullet is a high quality floor coating system unto itself. Ease of application is one of the big benefits of Rust Bullet that will attract the attention of many DIY enthusiasts. As we stated earlier, it does not require the same concrete preparation as epoxy and most paint products. According to Rust Bullet, acid etching or grinding of the concrete is not required. You can find their standard application guidelines here. The key is to clean the concrete thoroughly and remove any oil spots or grease on the floor. Pressure washing is a recommended method as well. If you have any concrete repairs that need to be done, do them first. One point to be aware of is that like epoxy coatings, a moisture test should be conducted before application. If any water is present, Rust Bullet recommends applying a penetrating sealer to the concrete before application. If you have any stubborn oil stains remaining after cleaning your garage floor, Rust Bullet recommends applying their Metal Blast product to the stain. 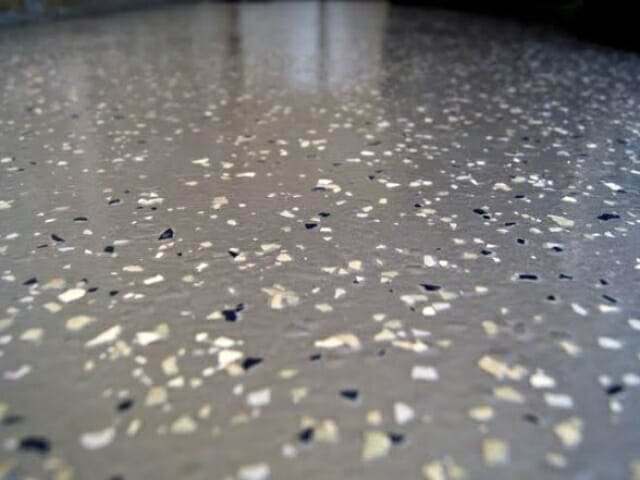 Metal Blast will enhance the adhesive qualities of the concrete surface where the stain is located by creating an anchor pattern for the paint to adhere to. It’s extremely important to make sure the floor is dry before application. Because Rust Bullet is moisture cured, any amount of water it comes in contact with during this process can have an adverse effect on the coating. They even make the point not to let sweat come in contact with the coating while it is being applied. Roll on your first coat with a quality lint free 3/8” nap roller making sure to cut in the edges with a chip brush. Depending on temperature and humidity, the second coat can be applied between 6-24 hours after the first coat, humidity dependent. If applying the second coat on the same day, Rust Bullet recommends not standing in one spot too long or wear spiked shoes to prevent damage to the coating. One note to make: Rust Bullet lists a much shorter re-coat time in their application guide. After further consultation, they recommend a longer wait period due to the fact that you will be walking on the floor in order to apply additional coats. 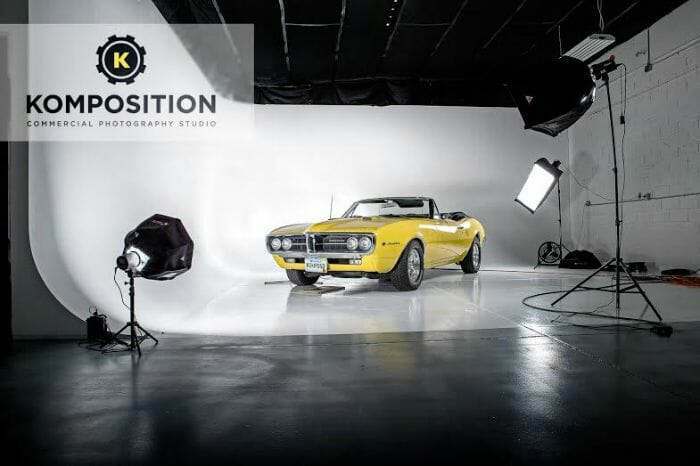 In 5 days the floor is fully cured and you can remove the cardboard without worry of tire marks, hot tire lift, or any other damage from your vehicles. 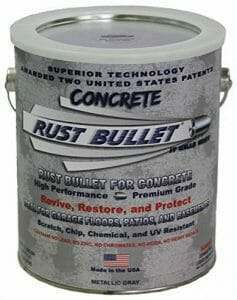 One of the more popular places to purchase Rust Bullet for Concrete is Amazon. Pricing can often be a few percentage points less than buying direct and the shipping is free. 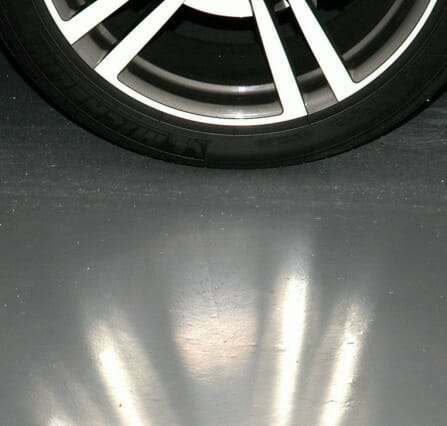 The solid metallic gray color in a semi-gloss has become very popular as a no nonsense, traditional looking floor paint color for automotive enthusiasts. It has proven to be very resistant to a variety of automotive fluids including acids. However, if you want to decorate the coating with color flakes you can. 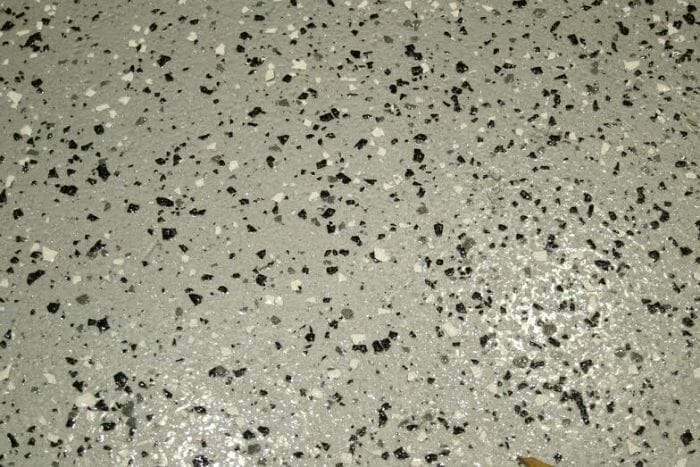 If you apply the color flakes, then you will need to apply a coat or two of the Rust Bullet Clear Coat for Concrete to lock in the color flakes. Not only does this protect the color flakes, it will also provide a high gloss finish. 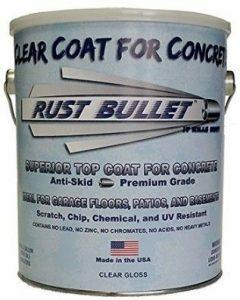 Lastly, if you have any stubborn stains that may interfere with proper adhesion, Rust Bullet recommends spraying the area with their optional Metal Blast. Though it does not surprise us, we have found that the only ColorShell coating that has garnered interest is White while the rest have not been very popular. However, if you are interested White you can find it here. We first published this article in the fall of 2014. At that time Rust Bullet was aware that some people were using their Standard formula as a garage floor coating – and with good success, but they didn’t realize the potential of the market since garage floors was not the reason Rust Bullet was developed in the first place. 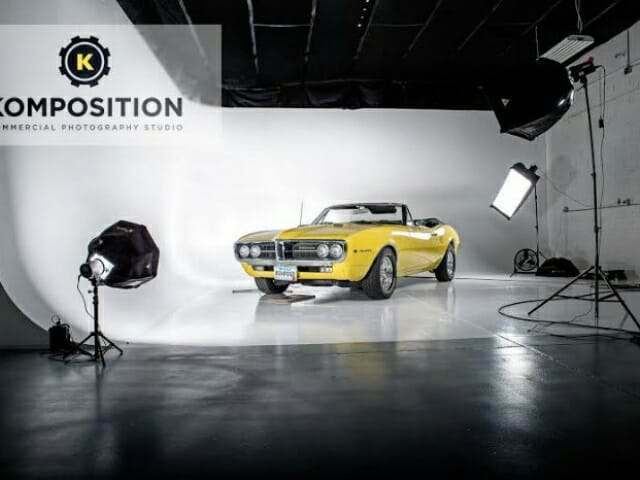 A few months later Garage Flooring LLC, a very reputable and respected national garage flooring vendor, contacted Rust Bullet with great interest after reading our article. Working with Rust Bullet, they soon began testing of the various Rust Bullet concrete coating products to see how they would perform. Needless to say, the testing went well. As a result of this testing, interest in Rust Bullet as a tough and durable garage floor coating has garnered national attention as a viable alternative to epoxy coatings and concrete paint. 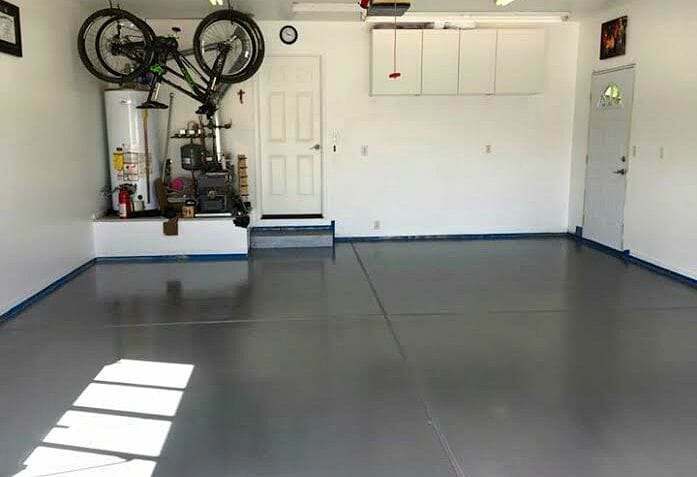 Though fairly new to the garage flooring market, it truly is a long lasting floor paint for your garage that will provide years of service without issue when applied correctly. 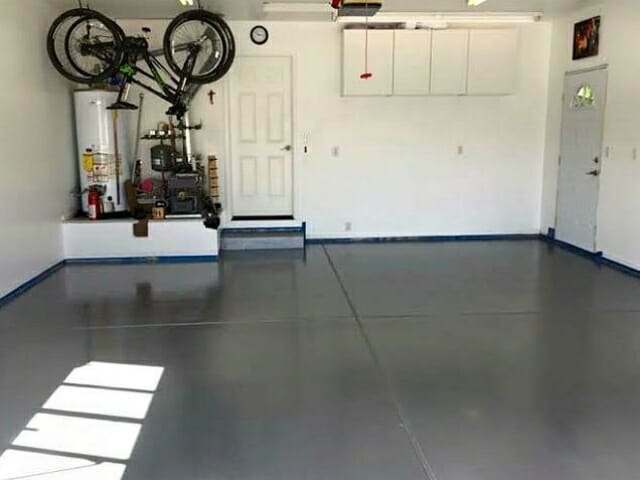 In our estimation, this product provides for a great compromise for those who want much more protection and durability than what a typical garage floor paint can provide, yet don’t want the expense and additional labor involved for a good epoxy coated garage floor system. 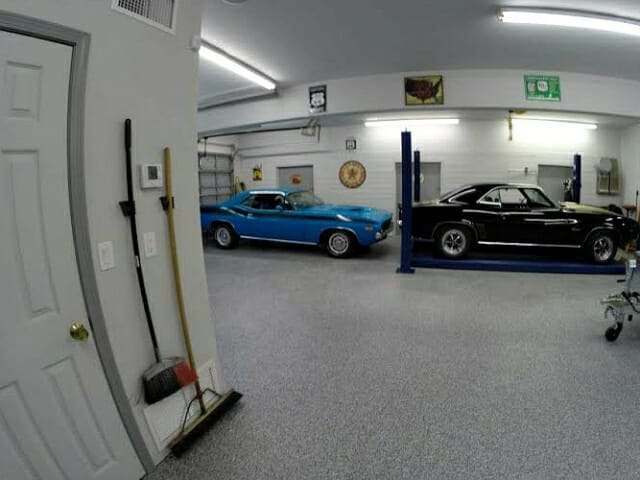 So if you’re in the market for a long lasting and durable floor paint for your garage that doesn’t require acid etching or grinding of your garage floor, Rust Bullet for Concrete just may be the compromise you have been looking for in garage floor protection. Greetings. We have been contemplating high quality latex concrete paint vs other treatments for out outdoor concrete porch. The porch floor is in good shape and clean but we’d like to spruce up the surface. A metallic gray color might just work very well. The porch is covered but the front of it gets lots of sun and some rain in our upstate NY summers. Can Rust Bullet or Rust Bullet Concrete be used in this application? Hello Norma. We recommend Rust Bullet’s new DuraGrade Concrete. We did an extensive review for it here. Garage Flooring web site states they are no longer recommending Rust Bullet products and will not sell them. Any insight as to why the recent change? Hello Steve. Garage Flooring LLC has suspended selling Rust Bullet products for now, though this may change. We don’t know the details, but we believe it has something to do with a difference in philosophies regarding customer service issues. Justin Krauss of Garage Flooring LLC highly values good customer service and demands the same from the products he sells. Nothing has changed with Rust Bullet that we are aware of and we still hear good reports about the long term performance. It remains a very popular product and sou can still purchase it from Amazon or Rust Bullet direct.